have you McValue Lunch’ed this week? Dear earthlings, have you McValue Lunch’ed this week? I thought it would take up quite some time for the food to be delivered. But surprisingly no, it’s delivered to my doorstep in just 15 minutes. So lucky and how convenient! Let me repeat myself again, incase, you thought that it’s a typo error. 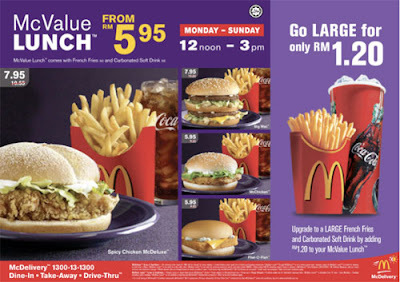 McValue Lunch is only RM5.95 AND it’s now available through McDelivery, Dine-In, Drive-Thru and Take-Away EVERYDAY which means 365 days per year from 12pm-3pm. With only RM5.95 you will be able to enjoy a scrumptious lunch. Awesome, yes? How great, no? Ok, other than that, there will be a McValue Lunch blogger contest which will be running now until the 31st of May 2009. The grand prize is the brand new iPhone 3G with 6 months contract from Maxis! I waaant! How come can pay RM10 note when earlier only have 6 ringgit? Lol. Gucci purse some more! Anyway, nice and creative clip there. Cheers! The video… haha…. looks interesting… Feel like want to create a video… XDXD and where you get to know about the contest? Oh lol MS Paint! Thanks, i had a really good laugh~ I guess i should go get my McValue lunch too! you’re not bad at all! very very nice, tzia! Wah you working at McDonalds now is it? LOL! This just means McDonalds will increase their prices yet again after this promotion is over. PAINT pulak, walao I cant stop laughing, paiseh sial. McD value lunch is better..
not scaring to have another layer on your tummy? omg. you are skinnier than what i thought. rongjing – wah. observant!! haha. lim – i didn't like kfc much though. haha. but the chessy wedges is nice!! rith – yes, you should! haha. luke – thanks. r u minyang? ANON – I know is kinda. lol. grave – bukan la. it's advertorial! longkachia – serious?! whoosh! i didn't notice that before this weih! ivank – haha. thanks worr! manga – oishhh! don't remind me! anon – haha, serious?! thanks. to another anon that i didn't approve your comment about the HIM, hmm, i will beware. but, i will not post it up. thanks! omg 10 bucks! thought you only have 6? handphone one thousand five ringgit ONLY?! GUCCI purse some more; it’s more expensive than the iPhone. nice video ya… but took you a long time to complete it. but never mind, you still did your best ya.. mwuah! !